After watching his older brother play for years, Cooper finally got the chance to play in his very own tee-ball game in March of 2016 Like any good ballplayer, when Cooper hit the ball during his first at bat, he quickly and excitedly ran to first base. Safe at first, Cooper began to get restless when the next batter took too long to get to the batters box. This was when Cooper decided to dance. Cooper heard music playing nearby and started to bounce his foot. He wiggled around and threw off his helmet to really let loose. One of the coaches standing nearby tried to help Cooper stay focused and put his helmet back on, but Cooper couldn’t fight the feeling and threw his helmet off again to dance. After the game, Cooper’s mom Nikki watched the video and fell in love with it. She uploaded the clip to her Facebook page to show her family and friends little Cooper’s dance moves. One of the Buell family members shared the video on Twitter to show her softball team and the video took off from there. On Twitter it got 20,000 retweets and 24,000 likes. It wasn’t long before Cooper was featured on Mashable, ESPN, and ABC News, and the Buell’s partnered with Jukin Media to maximize the value of their amazing video clip. The Buell family’s wild ride didn’t end there. 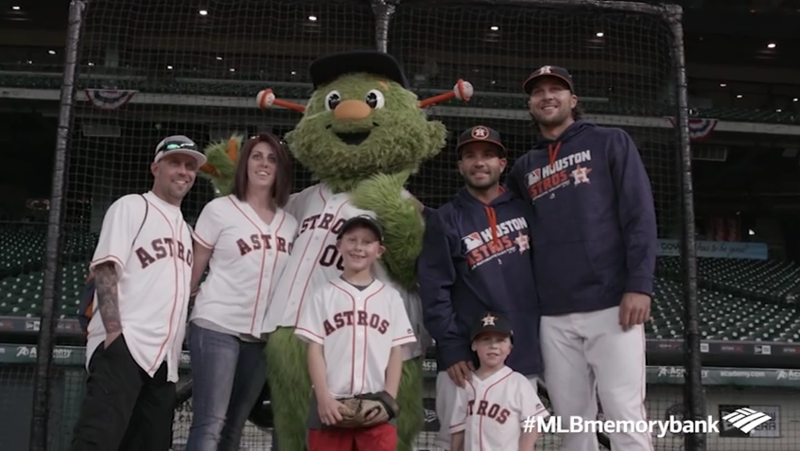 Within a week of the video’s viral run, Bank of America teamed up with the MLB’s Houston Astros to bring the Buell family to Houston, Texas as a part of Bank of America’s MLB Memory Bank campaign. The Memory Bank campaign brings baseball fans together to share their best baseball memories and to create new ones. After seeing little Cooper’s enthusiasm for tee-ball, Bank of America knew Cooper and the Buell family were a perfect fit to make a new MLB memory with the Houston Astros; with Jukin Media’s help, they were able to utilize the Buell’s amazing video to create a remarkable branded video for B of A. The family was even invited onto the field with players before the game began. 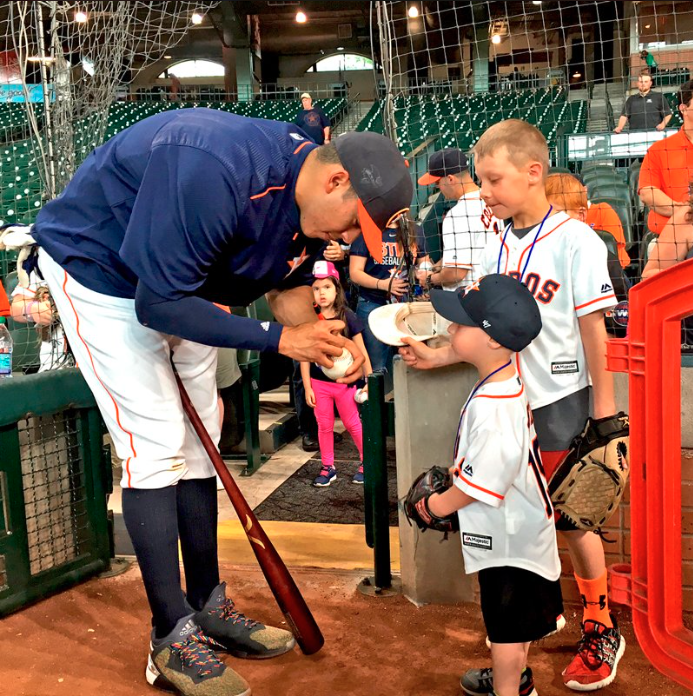 Jukin Media sat down with Nikki Buell and asked her about her family’s once-in-a-lifetime experience with having a viral video and getting the VIP treatment at Minute Maid Park in Houston. Jukin: Describe your video. Why did it happen? Nikki: Well, Cooper was playing in his first tee-ball game and my mother was recording. Cooper got on first base and just started dancing. He was probably on first base for about three minutes. He was just literally bored. This is normal for Cooper though. He dances all the time: to and from baseball and at daycare. Cooper dances everywhere. Nikki: Well, Cooper was playing in his first tee-ball game and my mother was recording. Cooper got on first base and just started dancing. He was probably on first base for about three minutes. He was literally just bored. This is normal for Cooper, though. He dances all the time: to and from baseball and at daycare. Cooper dances everywhere. Nikki: We thought it was super cute and really funny. I decided to post it to my Facebook page, which only has about 200 people, which all are our family and friends. That’s how my cousin who goes to Murray College saw the video and asked for the footage to tweet to her softball and baseball friends. It blew up from there. Nikki: I posted it on Facebook Monday night and on Tuesday morning. It had a ton of views and comments on Facebook. On Twitter, it had hundreds of retweets. Jukin: Did you get to see your video on the news or TV? 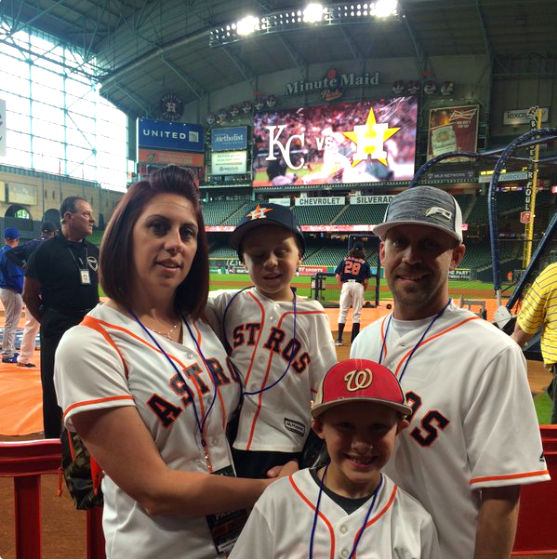 Jukin: How was your experience with Bank of America and the Astros? Nikki: It was just crazy. My husband asked me “Did that really just happen?” and I said “I think so.” It was amazing. It was so surreal. We got the full VIP treatment. We got to meet the players, go on the field, and custom gear. It was so cool. We are huge baseball fans. When we met the baseball players, they were interacting with our boys like they knew them. They wanted to hold them and even continued to interact with my boys after the first meeting. I mean it was incredible. Jose Altuve was so down to earth. My son kept calling him “my friend” and every time Coop acknowledged him, Jose acknowledged him back. I was so grateful. Jose could have just brushed him off, but he didn’t. I told my husband “ I just don’t know if I believe this right now.” Anything the boys wanted to do, they let us do. We had a full day planned out with all these full activities. We got the stadium to ourselves for two hours and we got to do whatever we wanted. It was totally on celebrities’ status. It was so much fun. I had to tell them that if they wanted Coop to be productive that we had to schedule in a naptime and they said “ We’ve never had to schedule nap time before.” My husband was on cloud 9. Nikki: Yes, they do. I mean at every game everybody recognizes him. If you don’t know who he is, he will start playing and as soon as he gets on base he’ll start dancing. That’s when the other team and the people in the crowd say, “Oh! That’s that little kid!” We’ve had that happen that the last three games. We try to tell Coop to stop dancing while he’s playing, but he loves to dance. Even when my cousin’s softball team sees cooper, they all want to take pictures with him and they all think he’s so adorable. Nikki: I learned that nothing on Facebook is private. I thought my video was only going to be seen by my family and friends, but look at us now. Nikki: You know, my phone was burning hot because I had some many notifications. My phone was ringing off the hook and we finally decided to sign with Jukin. My phone didn’t even have a chance to cool off. I didn’t even know how these outlets got my phone number. My phone almost broke and now that I’ve signed with Jukin, I don’t have to deal with anything. I can tell them to talk to Jukin because Jukin handles everything. Watch the originial video of Cooper getting down, here.